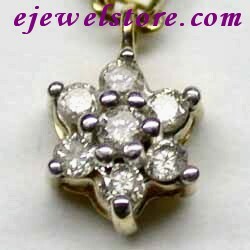 Includes Genuine white diamonds, totaling almost 1/4 carats, beautifully set in a flower design in Real 10K yellow Gold. 18 inches (45cm) in length. Please note that the Diamonds are Real, they are not man made or Lab Created or enhanced in any way.